Subject: Does thought precede language? This is a fine piece of work, which deals with themes that I find, personally, very gripping. It is not really a response to the question posed in the second set of essay questions (5. Does thought entail the possession of language?) but perhaps you did not intend it to be. The central issue, for you (as for me) concerns the nature and definition of reality: which is the fundamental question of metaphysics. The idea that the private language argument, far from being a true liberation merely exchanges one 'demon' for another is familiar to students of Wittgenstein. David Pears has a two volume study of Wittgenstein entitled 'The Language Prison'. The later Wittgenstein has been described as a 'linguistic idealist'. Michael Dummett, expositor of Frege and enthusiastic student of Wittgenstein's philosophy claims to have derived his account of an 'anti-realist theory of meaning' from Wittgenstein's later writings, in particular, the seminal doctrine that 'meaning is use'. It is typical of this kind of situation in philosophy that what those on one side see as liberation, those on the other see as a trap, or a prison. However, to describe this simply as a clash between 'anti-realists' and 'realists' (in Dummett's sense) seems to lose something of the essence of what you are talking about here. The idea that we were once in direct communion with 'reality' and have subsequently fallen from grace is not a new theme in philosophy. Plato's theory of recollection is one famous version of the theory. So long as we remain in mortal bodies, Socrates argues in the Phaedo, we can only have incomplete knowledge of the eternal forms with which the soul once communed in its previous life. That is why the true philosopher longs for death. The nineteenth century British idealist, F.H. Bradley, in his treatise 'Appearance and Reality', describes a tri-partite scheme, where starting from initial, pre-conceptual contact with Being, human thought and language dismembers the world using the apparatus of terms and relations. The job of metaphysics is to demonstrate how our concepts necessarily falsify reality, and to present a vision of the Absolute where all contradictions are finally overcome. What Lacan is describing seems very similar to Bradley's vision. The intriguing question is whether there can be any room - in our new-fangled linguistic philosophy - for speaking intelligibly of the 'Mystical' or the unity of Being (if indeed these are ultimately one and the same). Interestingly - and this strengthens the Lacan connection - in his book on Bradley, Richard Wollheim speculates that there is a Kleinian explanation underlying Bradley's approach to metaphysics. According to Klein's theory, the infant responds to its first experiences of frustration by 'splitting' the 'good mother' from the 'bad mother', the 'good breast' from the 'bad breast'. This leads to anxiety, which can only be overcome by restoring 'whole objects'. This is the pattern which underlies feeling remorse for wrong doing and acts of reparation in adult human relationships. There is a compelling parallel with Bradley's theory of the Absolute. The later Wittgenstein did not abandon his view that there were things beyond language: like ethics, aesthetics or our sense of the religious. In the works published after his death there is clear evidence of his interest. But unless one can find the appropriate language this is not much better than looking out through the bars of ones prison cell at a distant beyond. 'What you can't say you can't say, and you can't whistle it either', as Frank Ramsay said about the Tractatus. There is no doubt that the rejection of Cartesian epistemology is a 'liberation'. Even the fiercest critics of Wittgenstein's later philosophy do not suggest that we turn back the clock. The question for debate is whether we have, as Scruton claims, finally gained our freedom, or have merely exchanged one prison for another. My response is to refuse to consider the question in these terms. There is a long road towards 'emancipation' - whatever that might mean - and no-one has the right to state dogmatically how far along that road we are. We can only philosophize from where we stand now. The time has gone when one could pose grand questions in metaphysics and then give a give a conclusive answer. Even Bradley, with his lofty vision of metaphysics, described his approach as 'sceptical'. He gives very little positive information about his Absolute. Philosophy of Language is less popular now than it was in the 70's. Fashion, or the 'state of the art' now dictates that philosophers expend their energies on the philosophy of mind, where, we are told, the real breakthroughs are to be made. Personally, I'm not convinced. YouTube: Why am I here? Is knowledge justified true belief? Are possible worlds really real? What is the mind-body problem? Is it rational to fear death? "Here are emails which I wrote to my distance learning students from April 2001 onwards in response to essays they submitted for the six Pathways Programs, the Associate and Fellowship Awards from the International Society for Philosophers, and the Certificate, Diploma and BA (Hons) in Philosophy via the University of London International Programme." 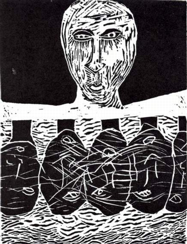 Wood engraving © Julia Saltiel 1999. Simple theme. Theme images by enot-poloskun. Powered by Blogger.